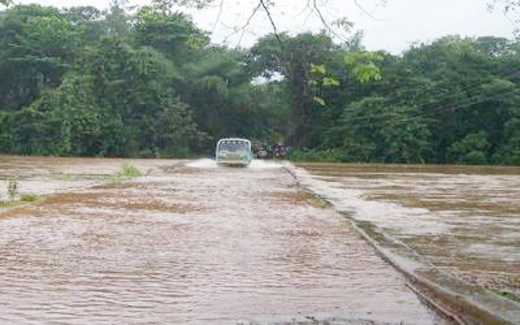 Uppinangady, July 9, 2015: Kumaradhara bridge, connecting the temple town of Subrahmanya gets submerged during every monsoon. The problem puts the life of people in Subramanya out of gear, the government had not taken measures to construct a bridge at an elevated level till recently. The work on the bridge is in progress. It has not made proper progress, as a result, the residents and the devotees are gravely inconvenienced due the waterlogged bridge. The proposal on upgrading the bridge was submitted several years ago, but has not been attended to in time. Now owing to some legal hurdle, the work on the bridge is held up. Even during this monsoon, the residents and to devotees have to depend on the old bridge. Since Shiradi Ghat is closed, most pilgrims arrive by the Puttur-Kadaba route and it inconveniences devotees coming from Uppinangady route. There was five ft water over the bridge preventing vehicular movement and home guards were deployed to check people from crossing the bridge recently. On Mangaluru-Uppinangady- Subrahmanya route, there is Hosamata and Kumaradhara bridges. When the bridge is inundated, the devotees from Bengaluru, Dharmasthala, Mangaluru and other places face inconvenience. With the mounting pressure, the government sanctioned fund for the construction of new bridge. However, the work is far below potential and delayed unusually. May be expected to be completed for the next monsoon. The tender for the construction of the bridge was invited in March , 2013. However, the code of conduct came in the way of initiating the work. The work commenced only in the month of November. Five pillars have been constructed. However, the work on one pillar is pending. It will commence only after the forest department gives consent. What the hell are our politicians doing ? Why are they finding any alternative road? This problem is common problem several years. This is a very common problem our people are facing . The government just makes fake promises.